I feel strange reviewing this. Although Anne makes it clear that she'd like her diary published, and does her best to make it a work of fiction by changing names, this is still a diary. This is Anne's personal account of her struggles, and the struggles of the seven other people living in the Secret Annexe. This is a collection of memories. Every page is full of her personal opinions on the others, her views on their behaviours and quirks, and every page is filled with an air of secrecy. These words are poured from the heart of a fourteen year old girl in hiding from the Nazis. For these reasons, this is not a book review. Anne's entries are surprising in various ways. To begin with, the general reader will think the diary to be a depressing read, and of course it is. But what surprised me was Anne's humourous anecdotes, her records of jokes told in the annexe, amusing things that happened, and beautiful relationships forming. The essence of family, and humanity, really shine through the pages, and although Anne often complains about her housemates, you really can read between the lines and see them pulling each other through this horrible time. I was particularly touched when Anne documented birthdays; the presents, the meals, the conversations. The presents get more frugal as time goes on, but the boarders always do their best for each other, despite the arguments they frequently have. What struck me most as Anne's diary progressed was her maturity, intelligence, and sheer wisdom; indescribable for a fourteen year old. Her views and opinions on the world were so clever and respectable, and I couldn't help but feel we have lost someone very very special; a great mind. This diary holds a lot of truth, and it belongs perfectly in that group of books everyone should have read at least once. It's important people continue to read this diary. We are so lucky that this special girl decided to take pen to paper and tell us about her time in hiding; no one else could have captivated us in this way. Without Anne, we wouldn't know how it felt to hide behind a bookcase, to live on mean food rations, and to dream of being out in the open air again. 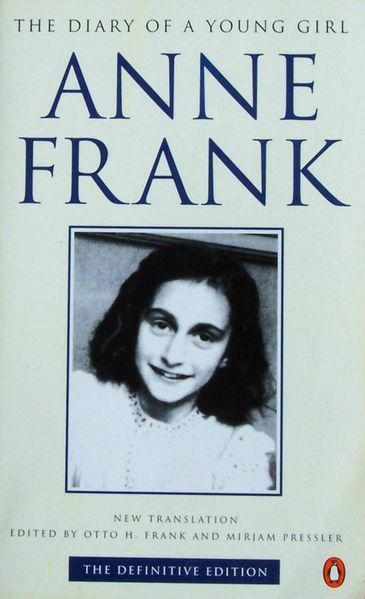 Anne passed away in Bergen-Belsen concentration camp in 1945, but she hasn't died yet.